Instead of an electrified cello with a piezo on the bridge or some sort of magnetic pickup, this cello is a purely electronic instrument. The fingerboard is metal, and the strings are made of kanthal wire, the same wire that goes into wire-wound resistors. As a note is fingered, the length of the string is ‘measured’ as a value of resistance and used to control an oscillator. Yes, it’s weird, but we’re wondering why we haven’t seen anything like this before. How does this cello sound? Remarkably like a cello. [jaromir] admits there are a few problems with the build — the fingerboard is too wide, and the fingerboard should probably be curved. That’s really an issue with the cellist, not the instrument itself, though. Seeing as how [jaromir] has never even held a cello, we’re calling this one a success. You can check out a video of this instrument playing Cello Suite No. 1 below. It actually does sound good, and there’s a lot of promise here. If you don’t get along with your orchestra, screw ‘em. [Vladimir Pliassov] proves that you can play each of the virtuosic string instruments yourself, all at the same time (with the exception of the double bass of course). For the life of me, I can’t imagine how long it took to get situated in this spider’s web of moving parts, but it’s impressive. With the help of this unique mechanical invention all his own, [Vladimir] is able to finger not only the neck of a violin and viola, but also a cello hoisted at an angle below his desk so that he can execute chords with his FEET. To help with the actual sound-making, a complex series of resinous fibers turn on a continuous mill of wooden beams and are tensioned ever so carefully over the bridge of each instrument. [Vladimir] controls which string is making contact with the turning fibers with a pulley wrapped around his thigh that rocks the body of the instrument back and forth. [Vladimir] gives us an overview of his machine and how it works in the video below. If you’re itching to see it used for the purpose it was created for, well… there’s a video for that too. Even though the quality of the performance suffers a little due to the complicated nature of the setup, [Vladimir] is playing of all things, a piece for the pipe organ by J.S. Bach. Bach being hard mode in any case, let alone the one where you’re playing all the instruments yourself. Thanks [tinkartank] for pointing out this unique invention. It’s definitely worthy of some awe! We totally missed the ball on this project. It should have been run on April Fools’ day and you would have no idea if it were real or a hoax. That’s because the very serious performance given after the break is hard to watch without a least a bit of a chuckle. 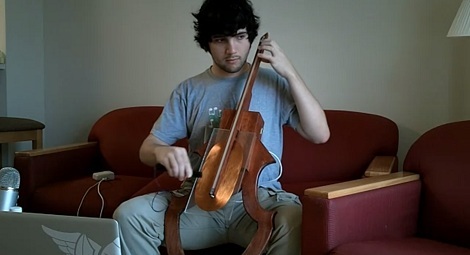 The instrument shown above is a Theremincello. 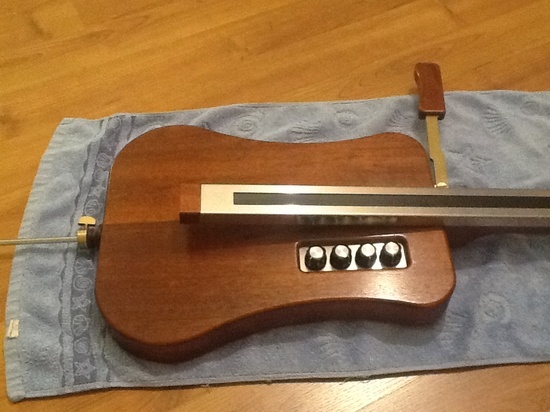 It’s an instrument in the shape of a cello which functions in a similar way to a Theremin. The instrument being played in that video clip is the first generation and the one pictured above is its successor. The creator wanted to refine the electronics so that the resulting sound wasn’t so ‘flutey’. The result can be heard on the video embedded in this Theremin World article and we think they’ve accomplished the goal; it sounds much better! In the clip [Thierry Frenkel] demonstrates changing notes on the fingerboard with the left hand. The right hand which would normally bow the strings operates the lever to adjust the volume of the note being played back. If a single fingerboard isn’t enough for your needs you may consider building this four-track design instead. Over the past few months, [Magnetovore] has been working on his magnetic cell project. It’s a very interesting instrument that seems right out of the electronic music explosion of the 1970s. Now, he’s ready to share his invention with the world, and we wouldn’t be surprised if we see this instrument being picked up by a few avant-garde musicians in the next few years. Last September, we were introduced to [Magnetovore]’s magnetic cello. The original version used four ribbon sensors for each of the strings and had completely analog electronics, leaving us wondering why this cello wasn’t invented in the 70s. The new version of the cello keeps the analog electronics that sound remarkably like a real acoustic cello, but does away with three of the ribbon sensors. 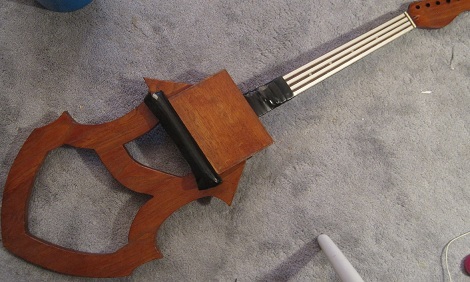 Now the cello has a single ribbon sensor being used as all four strings – to change which string is played, the musician just has to press a button on the ‘bow’. There is a drawback to using only one ribbon sensor; it’s now impossible to play two strings simultaneously as on an acoustic cello. The electronics in [Magnetovore]’s original magnetic cello were monophonic anyway, so we’ll chalk this design change-up to reducing component cost. After the break, you can check out a trio of very talented cellists playing [Magnetovore]’s magnetic cello. There’s the classic Pokemon Center theme, the Mario Bros. theme, as well a Bach minuet and a crazy improvisation showing off what the magnetic cello can do. Why wasn’t this magnetic cello made in the 70’s? [magnetovore] made himself an electronic cello. Instead of pulling a few cello samples off of an SD card, he did it the old school analog way. The finished build is really impressive and leaves us wondering why we haven’t seen anything like this before. [magnetovore] uses a permanent magnet to play each ‘string’. A lot of details are in this post and [magnetovore]’s provisional patent (PDF warning). From what we can gather, each string is a resistive ribbon sensor connected to a voltage controlled oscillator. The output of the VCO is sent to a variable gain amplifier that is controlled by a coil of wire and the magnetic ‘bow’. From the video (after the break), [magnetovore] already has an amazing reproduction of the cello sound. It’s a bit electronic on the lowest parts of the C string, but with a little bit of processing it could definitely pass for an acoustic instrument. We’re left wondering why we haven’t seen anything like this cello before. VCOs and VGAs were the bread and butter of the old Moogs and even the ancient ondes martenot. Ribbon controllers were being attached to electronic instruments back in the 50’s, so we’re really at a loss on why a magnetic cello is new to us. If any Hack A Day readers have seen anything like this before, leave a message in the comments.